Chestnuts have always been my favorite and there are just so many ways to cook them. For example, they can be boiled, grilled, roasted, made into a soup, or braised in a dish. 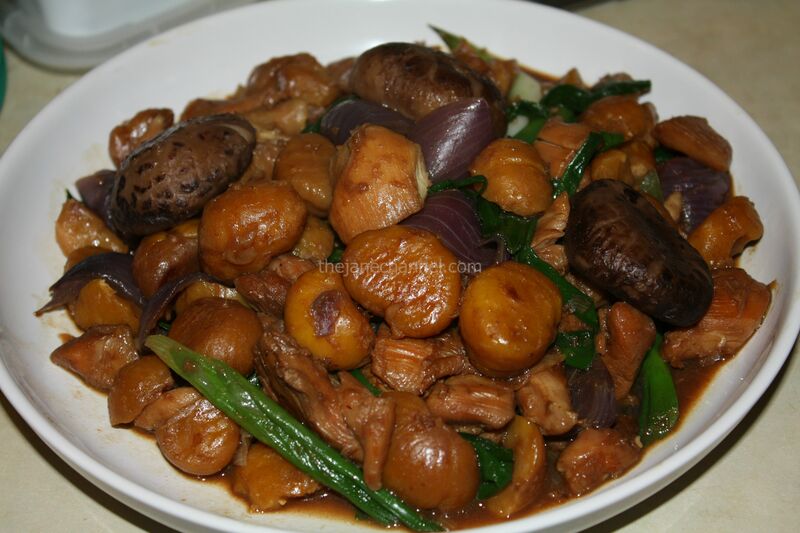 A popular Chinese way to cook with them is to braise them with chicken. The nutty flavor of the chestnuts complements the chicken very well. Braising ensures that the chestnuts are softened enough to create that melt in your mouth texture. Heat oil in a wok/saucepan, stir fry ginger, shallots, garlics for 2 minutes. Stir in chicken, cook until both sides golden. Add onions and cook for 1 minute. Add chestnuts, dried mushrooms, oyster sauce, sugar, soy sauce, chicken stock and the reserved mushroom water. Bring it to boil, then turn to low heat, cover and simmers for 20 minutes or until chestnuts are tender. Stir in scallions. Remove from heat and stir in sesame oil. My all time favorite!!!!! The chestnuts of course!